Hét ambassador of the Dutch icons; the typical-Dutch wooden shoes. Nijhuis Klompen produces them from 4 cm off. Also in the wooden shoe souvenir world Nijhuis Klompen is very active. 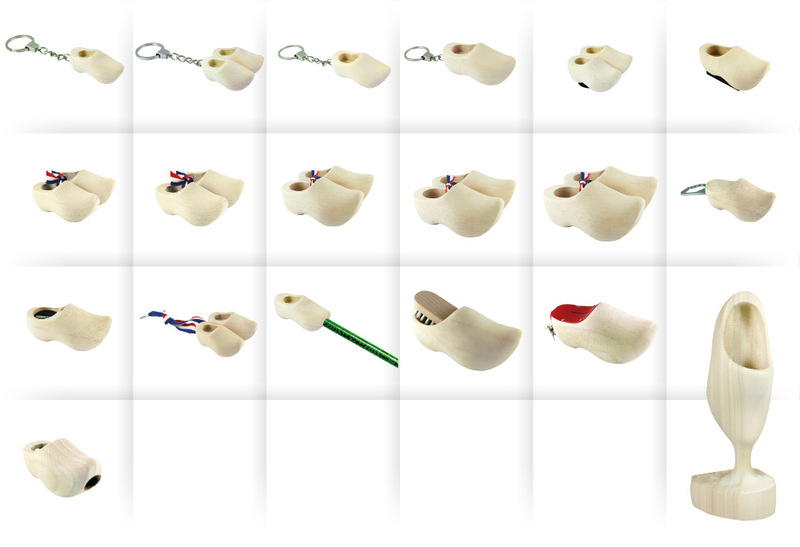 As only Dutch company we can say that the production of the wooden shoe souvenirs are produced in our own company. So in that way we can guarantee the quality of our products; even for the smallest ones. Nijhuis Klompen has lots of wooden shoe-souvenirs; from keychains, till flower clogs and from bottle openers till money boxes. And these souvenirs are available in many colours and decorations. And last but not least: Nijhuis Klompen has all of the souvenirs on stock so we can send out every working day of the week to our customers. Do you want more information? Please contact our sales team. For our full assortment please see our online catalogue. A wooden shoe souvenir designed with the most famous Dutch symbols; windmills and tulips. That’s the way how tourists form over the whole world see Holland. All these symbols are integrated in the Tulip decoration of Nijhuis Klompen; by far the most populair design we produce. Bright and very recognizable, even on our smallest articles; the 4 cm keychains and magnets. These decorations are available in an extensive collection and available in 11 different colours: red, white, blue, lackered, yellow, orange, pink, lime, purple, black and Delft blue. This Tulip decoration is also available in wearable wooden shoes. The kissing pair… lots of foreign tourists love it! The tulips border in very bright colors are making it a happy picture. 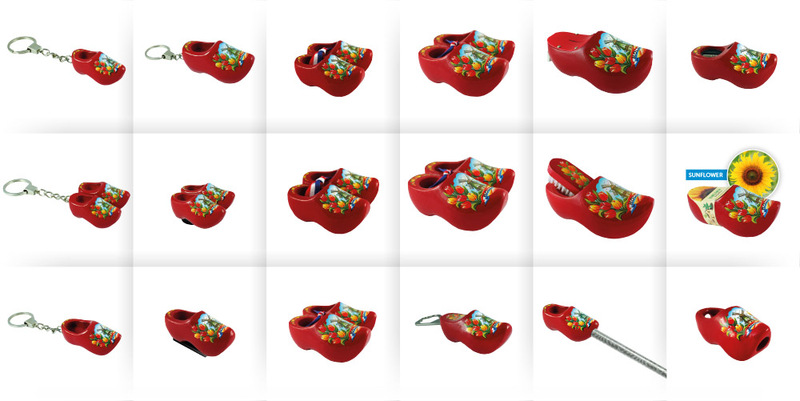 The Kissing pair-collection is available in red, orange, pink, lime, purple and Delft blue. Sometimes it may a bit fancier… elegant and with flair, colourful and with a luxury appearance. The Nijhuis Klompen Poly Mill 4 decoration has this appearance. A beautiful decorated assortment of wooden shoe souvenirs and wearable wooden shoes with a elegant typical Dutch composition tafereel and flower decoration over the sides of the wooden shoes. The most traditional decoration in the wooden shoe world for sure is the yellow farmer decoration. In the early days every wooden shoe maker in Holland had an own decoration and this one is the Nijhuis decoration. The wooden shoes became decorated by finger those days. So you could see is a kind of an unique finger print. 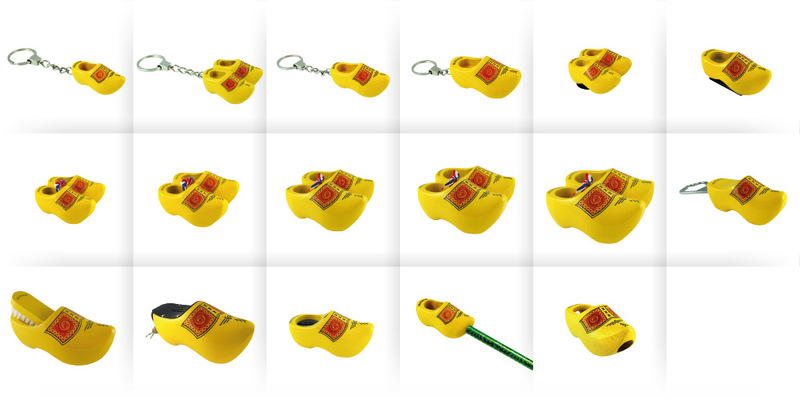 So we produce our yellow farmer decoration very proudly on our souvenirs and wearable wooden shoes! Fields, vast meadows and flat landscapes… that’s also Holland. And in the fields are.. cows! Nijhuis Klompen has an assortment with funny black cow-spot souvenirs. Recognizable for tourists from in and outside the Netherlands. There is just one city for the tourists who’re visiting Holland and that’s Amsterdam. Our own very famous world city an we can be proud of it! 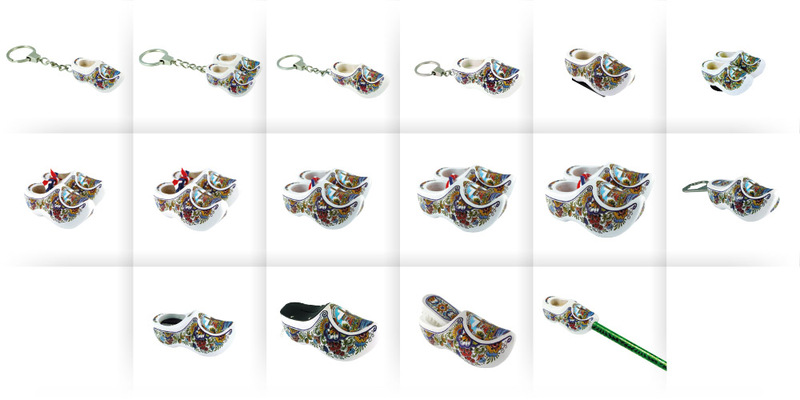 So, off course we have an assortment with Amsterdam decoration souvenirs. A typical Dutch icon with the Amsterdams weapon, painted in a beautiful red colour. So this should not be missed in an Amsterdamse souvenir-shop! Friesland; a very special province inhabited by proud people with an unique identity. No wonder Friesland presents herself in a special way. And the souvenirs of Nijhuis Klompen are fitting perfectly in this way. Especially for the tourists in Friesland Nijhuis has developed an assortment of beautiful souvenirs with Frisian design. And we did this also for the wearable wooden shoes. We produce wearable wooden shoes from the smallest size for children till the biggest size for gents with a typical Frisian-design. As basic as it can be… that’s sometimes the most beautiful way. The sanded wooden shoes of Nijhuis Klompen are produced out of te best wood en and sanded until they’re feeling like silk. Our sanded products are available in a lot of different articles, from 4 till 14 cm. Wooden shoe keychains in funny colours, decorated with de letters A – Z… a perfect souvenir for who like to buy some souvernirs for their friends and family at home. a beautiful reminder of a visit to Holland. Our alphabet keychains are available in mixed colors and packed per letter. Especially for these keychains we designed a table-display, which can be ordered also.